That’s what I said to Cliff Dickinson, N1RCQ, back a month or so ago about the first public-service ham radio event of the year on the flanks of Mt. Washington. 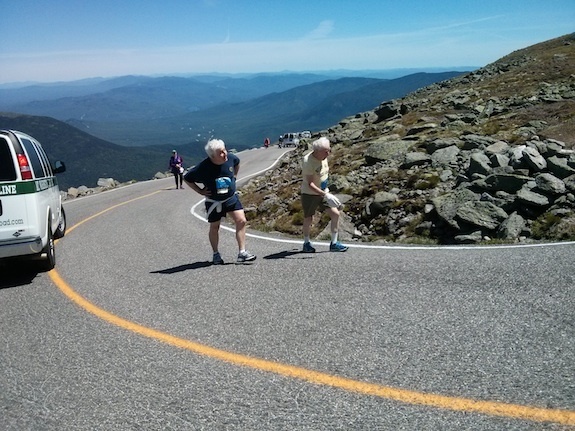 It was time for over 1,200 people to run, run/walk or walk to the top of Mt. Washington with the race set to start at 9:00 a.m. I knew I’d be busy with re-roofing my home and I also felt there would be other new hams who would want to experience the epic nature of providing emergency communications on the infamous Mt. Washington Auto Road. But as things turned out, Cliff needed me and I was driving towards the iconic mountain at 5:30 a.m. on Saturday June 20, 2015. It’s a good thing I left a little early because once I was on the north side of Crawford Notch, I got stuck in a quarter-mile backup of runners and other volunteers who were trying to pull into the event. The day was cool and sunny. It was a rare bluebird day at the rock pile as Mt. Washington is affectionately known by those that work there and visit on a regular basis. 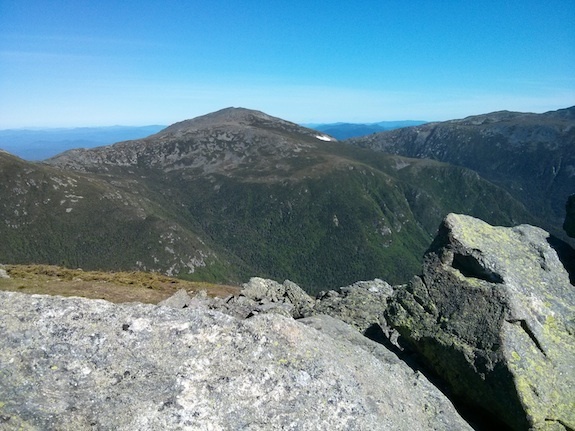 The term comes from the random large rocks that litter the top 1,000 feet or so of the mountain. The continental glaciers weren’t thick enough to completely cover Mt. Washington and carry them away. Normal weathering has left behind the millions of rocks of all shapes and sizes you see towards the top of this magnificent mountain. The base area of Mt. Washington was a hive of activity. Runners, friends or spouses of runners, volunteers, auto road employees were all bustling about. It’s controlled bedlam. 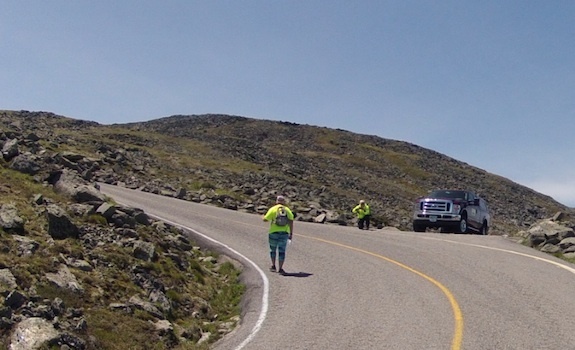 Hundreds of runners have a friend or family member take a car up to the summit so the runner can have a ride back down after the race. This traffic clogs the auto road from 7:15 a.m. until about 8:30 a.m. After that, the race organizers close down the road to all but authorized support vehicles. 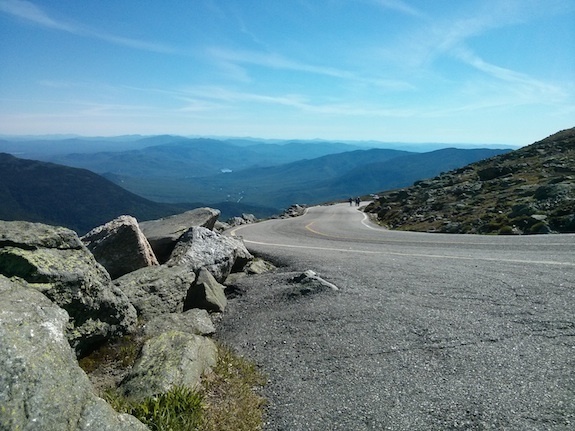 I was stationed at the Hairpin Turn that’s just below the cow pasture near the summit. It’s about 700 feet in elevation below the summit. It’s a little over six miles from the base area to the Hairpin Turn. This location has a great view out to the northeast and across to a few of the other peaks of the Presidential Range of the White Mountains. You’re at the top of what they call the Great Gorge. My favorite part of an event on Mt. Washington is what I call the lull. After the auto road closes but before the race begins, it’s just you and the mountain. On this particular bright and clear day, it was truly food for the soul. The lull lasts longer the higher you are on the mountain. In my case it took the lead runner about 45 minutes to make it up to my location. I usually ask to be higher up on the mountain for this reason, plus I enjoy the views when the weather cooperates. Not only was it cloud-free – a rarity at this weird weather location – but it was unusually calm. There was not much wind. That’s even more rare. This particular day it was peaceful, serene and quiet. It was just me and a black spider that must have had some roadrunner DNA in it because he could scatter over the blacktop like a quarter horse. Before the race begins, it’s a normal practice for the net control operator to perform a roll call to make sure all the other radio operators are ready and the radio signals are strong. Each operator chimed in when called and some talked about food. I was fixated on pulled pork for some reason. The race began and within an hour runners of all ages were huffing and puffing their way past me. 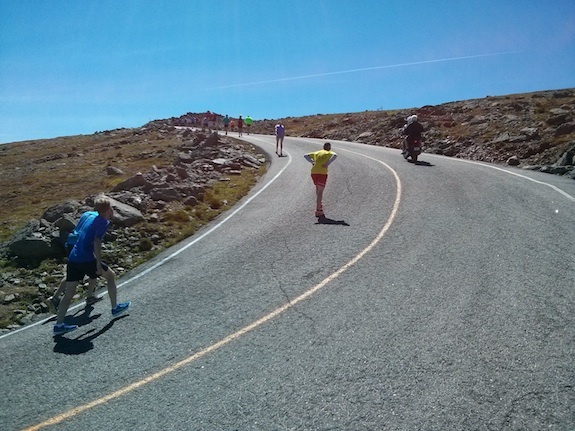 The Hairpin Turn location is a mentally tough part of the course for many runners. The grade at the inside part of the turn, the line most runners take, approaches 25 percent or more. By the time most runners get to this point, they’re exhausted and each step is an effort. One woman was eternally grateful I took a crushed empty paper cup she got from the last water stop. A silly paper cup. How much does an empty paper cup weigh? Maybe a half an ounce? But after six grueling miles, to the average runner, it may seem like 50 pounds. Many of the runners groaned or lamented out loud when they saw they had to grind their way up and past this short and steep part of the course. As I watched each runner looking for signs of distress, my biggest takeaway was determination and goal setting. I got to see George Etzweiler again. George is 95 years old and this year his running or walking companion was his 65-year-old son. Two years ago it was his grand daughter Katie. George made it to the top grunting with each exhaled breath. How bad did he want to finish? What was his level of determination? Not too far behind George was the last competitor. I don’t know her name. But she did finish the race and she was all alone doing it. I don’t know about you, but I’m going to use this race as inspiration to finish all sorts of projects, many of which have nothing to do with physical exercise. I believe it’s all about mental toughness at the end of the day. 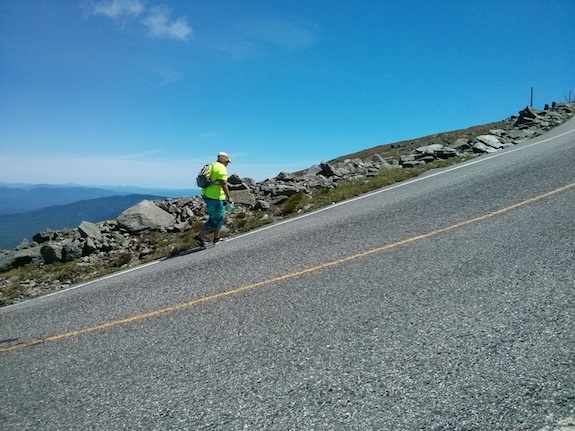 The last runner, and just about every runner that day on Mt. Washington, decided she wasn’t going to give up and her legs obeyed willingly. Good for her, George and all others who displayed such strong mental fortitude! What are you going to finish now? Tell me in the comment section below. 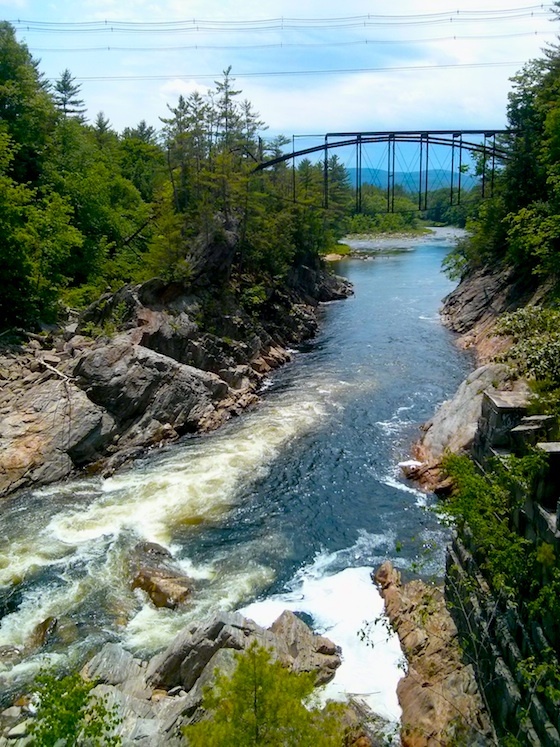 Livermore Falls is just 500 feet upstream (behind me and over my left shoulder as I shot this photo) from this very rare lenticular arch bridge. 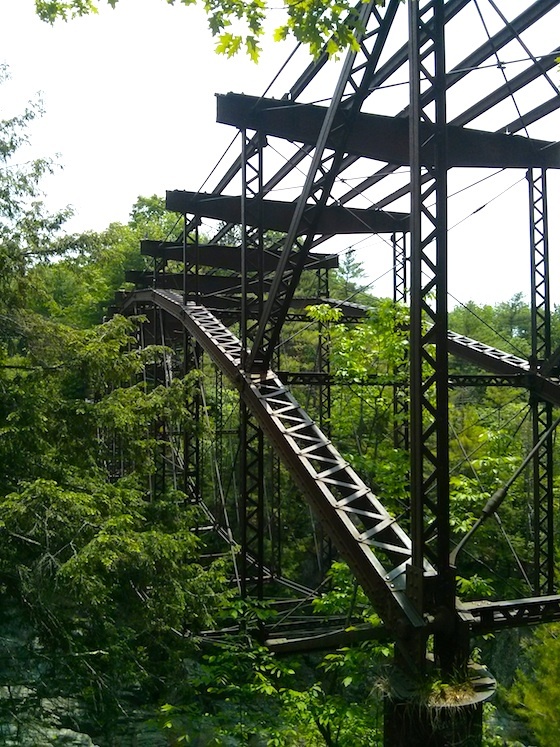 It was built by the Berlin Iron Bridge Company based in East Berlin, CT in 1886 for a total cost of $7,100. Wrought iron was used instead of today’s more ductile steel. This bridge employed a unique Pratt truss with bowed upper and lower iron chords. It used to have cars go across the top. There was a smaller span to the left – see postcard image below – but it was removed by a scrap dealer back in 1959. Legend has it that the scrap dealer lost a piece of heavy demolition equipment taking down the smaller east span. As that section fell into the abyss, the machinery tumbled down into the gorge. The contractor then abandoned the job and the main span still stands to this day. Copyright 2018 Tim Carter. 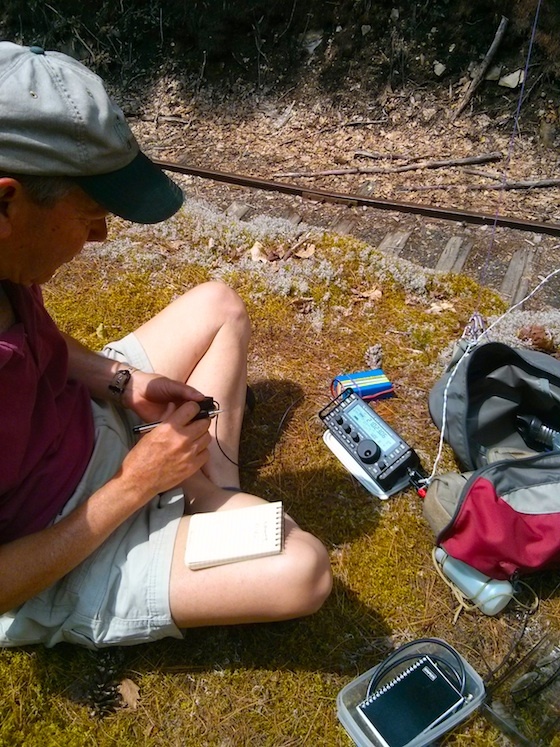 The hot temperatures today gave me a chance to do a much-needed outdoor radio adventure with Jim, W1PID at the stunning Livermore Falls located in a deep gorge of metamorphic rock sliced in two by the Pemigewasset River. 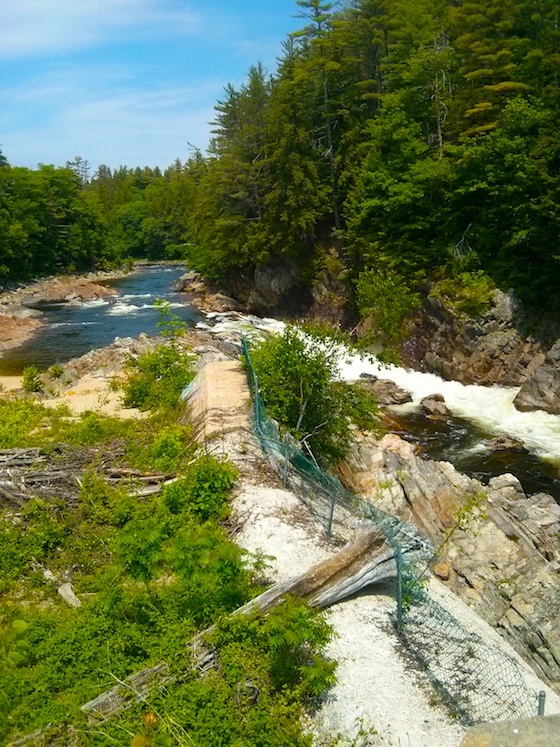 Livermore Falls are located within the town limits of Campton, New Hampshire in central New Hampshire. Travel north out of Plymouth, New Hampshire along the west side of the Pemi as the locals call it, and you’ll most probably hear them. I’m re-roofing my house and it’s so hot on the roof after 10 a.m. when the sun’s out, I’ve decided for my own safety and sanity to work early morning and late afternoon unless it’s cloudy. Today was a therapeutic day of outdoor radio for the soul. 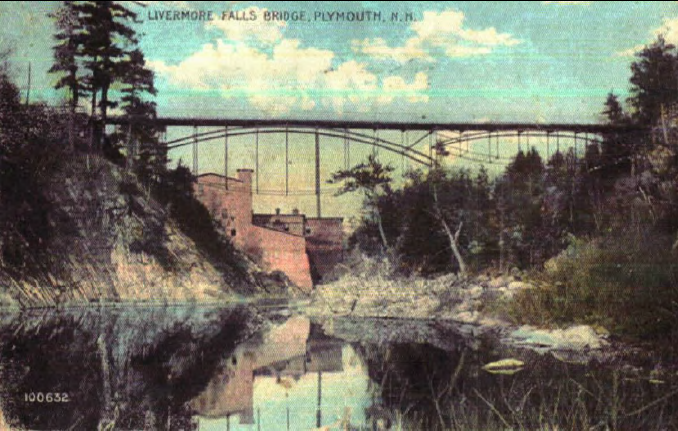 Livermore Falls is a great spot for young people who come to swim and swing from a long rope tied to an old rusty bridge splashing into the cool deep water of the Pemi as locals call it. You can see the normal water flow and tranquil nature of the river after it flows under the bridge in the photo at the top of this article. However, the Pemi can transform into a raging beast when a hurricane or monster Nor’easter produces vast amounts of rain in a short time. 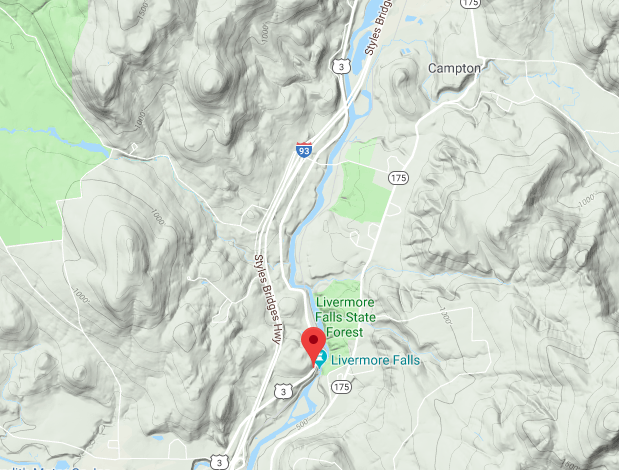 Watch the video just below to see why you’d not want to be near Livermore Falls when this happens. This footage was captured on the morning of October 30, 2017 just after a monster Nor’easter lashed all of New Hampshire. IMPORTANT NOTE: This video was shot standing at the exact same spot as I was standing when I shot the photo at the top of this article. Pay close attention to the water flowing through the rampart notches in the foundation of the old mill around 0:10 to 0:13. Then go up to the photo and look at the same notches in the lower right of the photo. My guesstimate is the river was 20 feet higher, or more, than what it is at normal flow. You know if this bridge could talk it would have scores of great stories. Imagine what it could say about some of the times the river was raging below trying to sweep the iron away. Today I was fishing for some DX above the frothy water and barely avoided a skunk even though the 20-meter band was pulsating from dead to alive much like blobs float around in a lava lamp. Jim set up in the sun about 100 feet away in the hot sun under his new dipole antenna. With his multi-band Elecraft KX3 he worked Russia, Israel, and Italy. I was restricted to 20 meters because I couldn’t get my par EndFedz antenna up as high as I would have liked to take advantage of its 40-meter extra length. The KX3 gives you so many possibilities with its built-in tuner. When I first powered up my trusty HB-1B the band was dead. I mean no breath, no signals, no nothing dead-on-arrival DEAD. My radio, on it’s best day, puts out a meager five watts. This is the upper threshold of low-powered radio, better known as QRP. If you decide to do outdoor QRP radio, you discover in short order that to be successful you need some luck and patience. Today I was looking for a little help from the sun since it wasn’t scalding me on my roof. I needed it to energize the atmosphere just right to help me make a contact or two or three. But that’s the fun of outdoor radio. You don’t know what you’ll get and so much depends on things you can’t control. This is what makes a completed QSO that much more fulfilling. I tuned up and down 20 meters and all of a sudden while at 14.060 I heard the faintest CQ being called. It was Roger, K3RNC from Maryland. He answered me back. 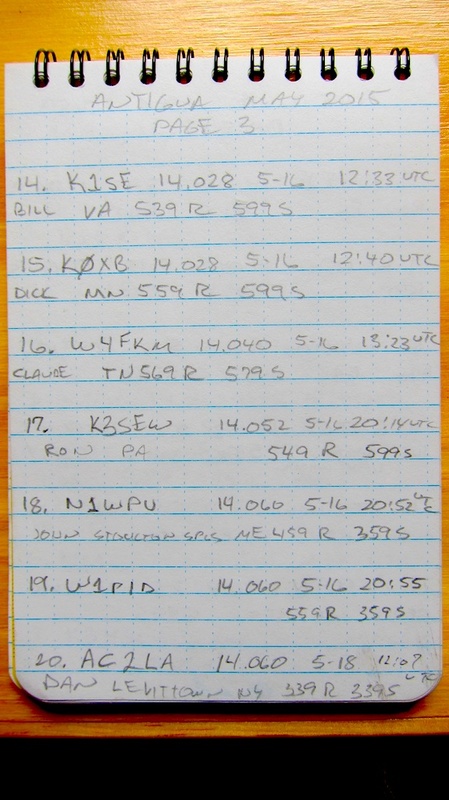 After exchanging RST reports, I gave him a generous 359 and he have me a 559, I told him I was QRP. Here I am moments after my QSO with Roger in Maryland. TNX Roger! After my QSO I walked up to tell Jim and he was busy working a station. He then got up and came down and put his arm around me. “What’s that for?” I asked because it’s rare for us men to show affection. “I’m glad you’re here. I’m glad you made a contact. It’s a fantastic day here,” he replied with a huge grin on his face. It’s has been an odd spring this year with me gone to Antigua and then coming back working on my roof. What I thought would be lots of outdoor radio days this season has turned into just an outing here and there for me. I enjoy Jim’s company and I know he does mine even if I still have pitiful slow CW skills. It’s no matter. I’m getting better and I’m having fun. He’s always told me to focus on fun, but keeps saying I’ll have more fun if I’m faster. Only time will tell, but it ain’t talkin’. Who knows better than Kenny Chesney. I love everything about Livermore Falls. My college degree is geology and seeing very hard rock resist the cutting action of running water for thousands of years is almost as exciting as making a contact pulling faint radio waves from the ether. This kind of beauty surrounds Jim and me in NH. Livermore Falls are right there in the center of the photo where the green chainlink fence ends. We’re so lucky to live here. You can see how high the water can get looking at the dead tree impaling the fence and the driftwood above it. Before I set up, I decided to take a walk to the base of the bridge where it connects to the earth. 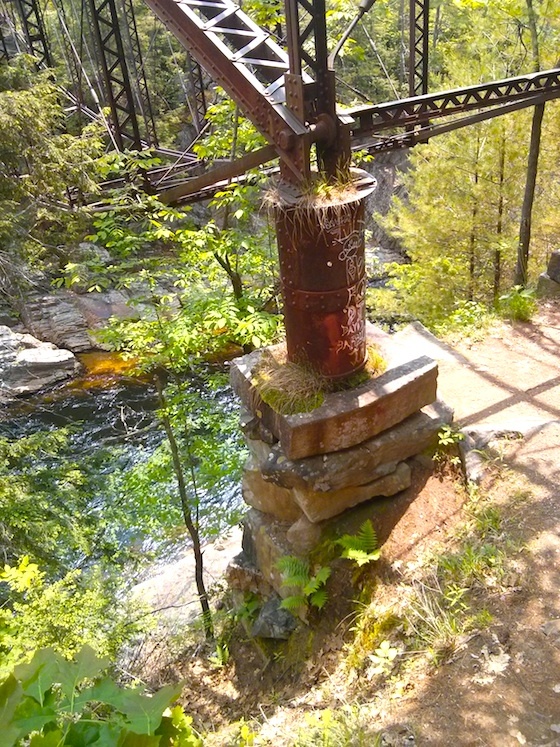 I wonder how many drivers would go over the bridge again a year ago if they saw how one of the primary piers was supported on stacked slabs of granite! It’s easy to forget how blessed I am being able to drive just 30 or 45 minutes from my house to countless gorgeous scenic outdoor locations here in New Hampshire. My guess is tens of thousands of other operators across the world would jump at the chance to do what Jim and I do. I remind myself after each outing to never ever take this beauty for granted. I’ll do my best to chronicle and share each scenic outdoor adventure with you as they happen. If you have a chance to get outdoors, do it. It’s a completely different amateur radio experience. On May 14, 2015 I whisked through immigration and customs at the John Bird International Airport in St. John’s, Antigua for the second time in three years. Business as an expert witness in a trial concerning construction defects in the home of the Brazilian Ambassador drew me to this island that’s part of the Lesser Antilles in the Caribbean Sea. 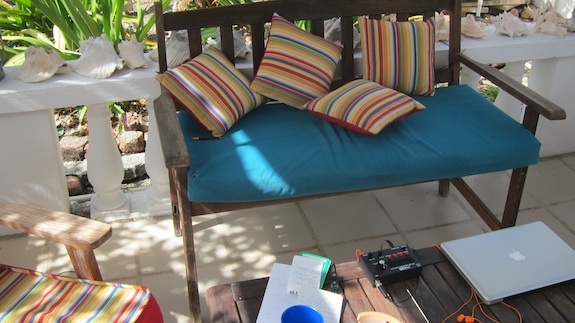 I was to spend a week on this tropical island with lots of time to get on the air with my QRP radio, the trusty HB-1B. Never before had I had the real chance to operate relaxed on the air for hours. It was my chance to hone my beginner skills at CW. It was to be my first time operating next to a giant puddle of salt water which helps radio signals. Believe me, I’d need help! I was filled with excitement about what might happen in the next seven days, the trial notwithstanding! I live in New Hampshire and the winter of 2014-2015 was bitter cold. Spring came late to the great Northeast Kingdom. The morning I flew out of JFK airport, the air temperature in New York City was below 50 F.
Suffice it to say that the hot and humid weather in Antigua was a shock to my system. Being so close to the equator, the sun’s infrared and ultraviolet rays are intense from 10 a.m. until 4:00 p.m. It was hard to be in the sun in the middle of the day without great discomfort. 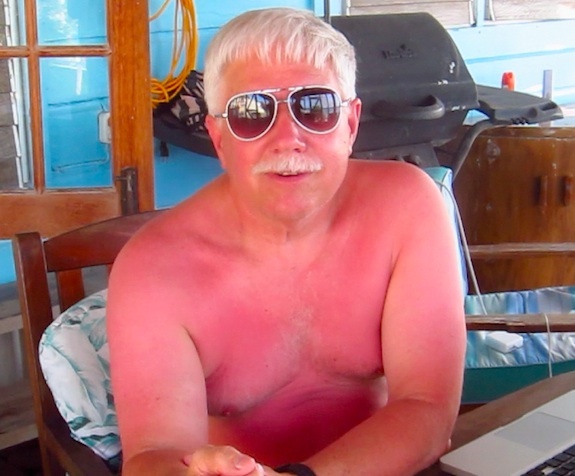 On the third day there I got sunburned and my new name was Lobster Man. Need I say more? Wait TEN MINUTES before jumping in pool. 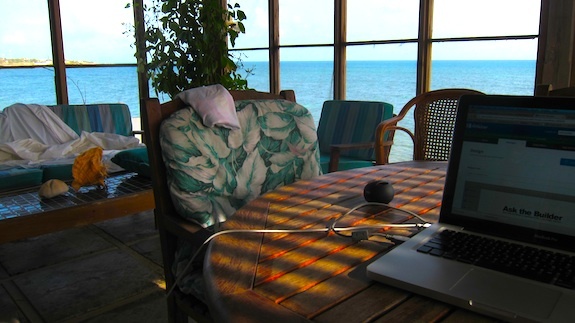 I stayed in an older small two-bedroom house that’s just 30 feet from the sea. The owners call this quaint and romantic hut the Love Shack as they have guests stay in it frequently. This is the Love Shack as it’s called by the owners. 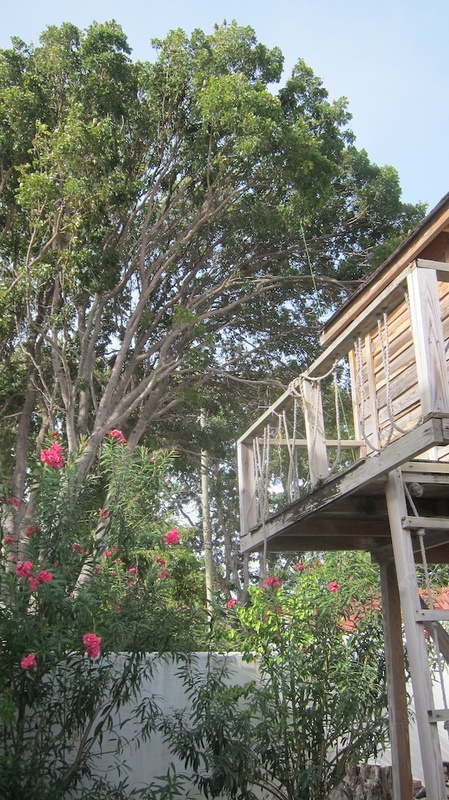 It had a glorious screened-in porch that faces the deep blue and turquoise water, but there was no nearby tree at this end of the abode to put up an antenna. 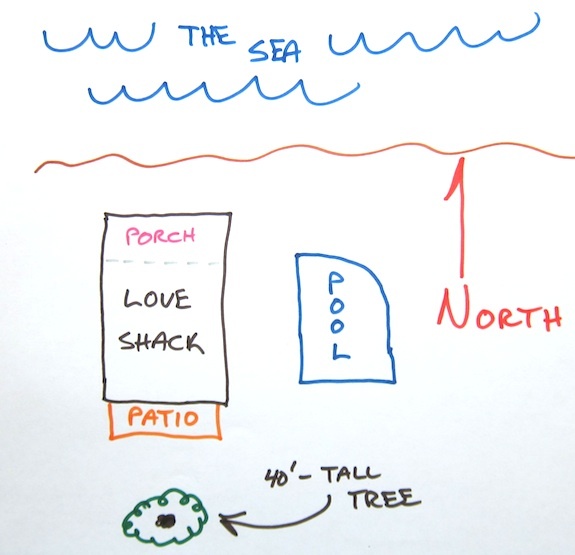 This is a simple map of the shack in relation to the sea and the tree. As a result, I operated most of the time on a patio at the other end of the shack. Most of my contacts happened sitting on this bench. One day a lizard tried to take a bite out of one of my toes here. Bad lizard. Right next to the patio was a wondrous tree that accepted my micro-cord halyard with no complaints. Once the cord is up in the tree, it’s not an issue to haul up the antenna. The tree did its job. Five of the nights I stayed there, I slept on a couch on the porch. It was glorious listening to the waves crash on the rocks. This is inside the screened porch looking out. You can see there on the left my unmade bed. Life is hard in Antigua. As you might imagine, it’s pitch black at night down there. The humid air makes it difficult to see lots of stars, but in the middle of the night on May 18th, I saw a brilliant shooting star. It was so vivid and the light so bright I was in awe. It streaked across Boone’s Bay and was the brightest shooting star I’ve ever seen. I don’t know why I was awake to see it, but I felt it was a sign that my radio fortunes would increase the remainder of the trip. This is the shore just below the screened porch. I can still hear the gentle waves washing up on the limestone. The tide level each 6 hours rose or fell only about 30 inches is my guess. I brought with me my tested and reliable par EndFedz 10, 20 and 40-meter antenna. It was the workhorse most of the days. This is a marvelous antenna for outdoor radio. The wire is as thin as an uncooked piece of angel-hair spaghetti. 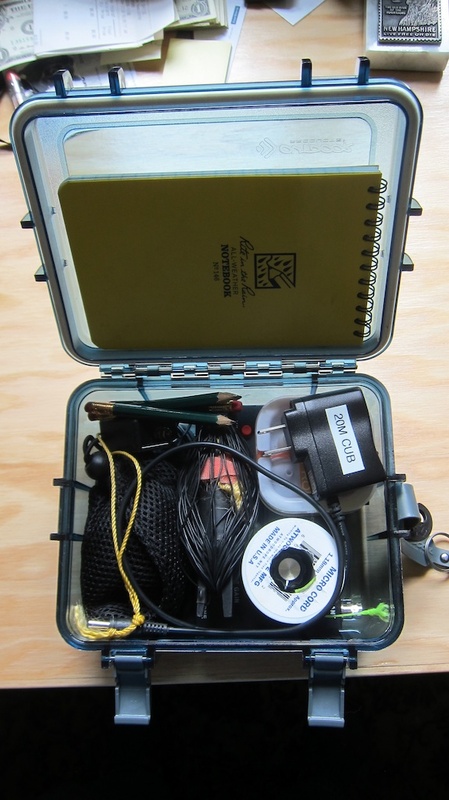 All of my gear that I needed to operate fit into a water-resistant plastic box that’s only 3.5 inches tall, 7 inches wide and 6 inches deep. Isn’t that amazing? Everything is in this box. The HB-1B is buried down under everything else. The only thing I need to operate is a rock to help get the green micro cord halyard up into a tree. A partially filled water bottle is my weapon of choice. Less than two weeks before arriving, I also made a resonant center-fed 30-M dipole antenna as the HB-1B is set up for that band. The first day there I set up my par EndFedz antenna as a sloper in the giant tree. It sloped to the north and it appears that was my best setup during the trip. On the second day I threw the halyard higher in the tree and achieved a nearly vertical set up with the par. I was able to make contacts, but not as many as with it as a sloper. Propagation could have also been an issue. On the last day I finally set up my resonant 30-M dipole and it worked quite well. It was a gentle sloper starting high up in the great tree and the other end was close to the screened-in porch. It also sloped to the north. 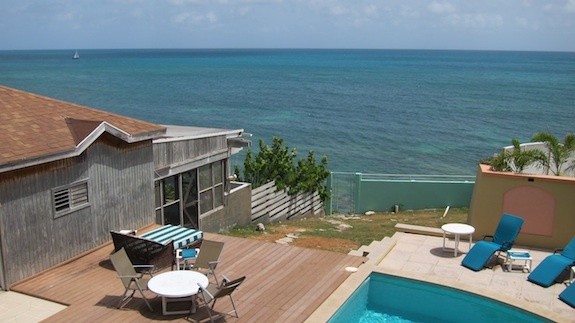 To operate legally in Antigua, you need to obtain a license from the government. You can read all about that process and how I got my Antiguan call sign V25TB. What’s the old saying? Timing is everything. The band conditions during the period of May 14 – 20, 2015 were not the best. Add to that the difficulty of operating at a power level of 5 watts or less. 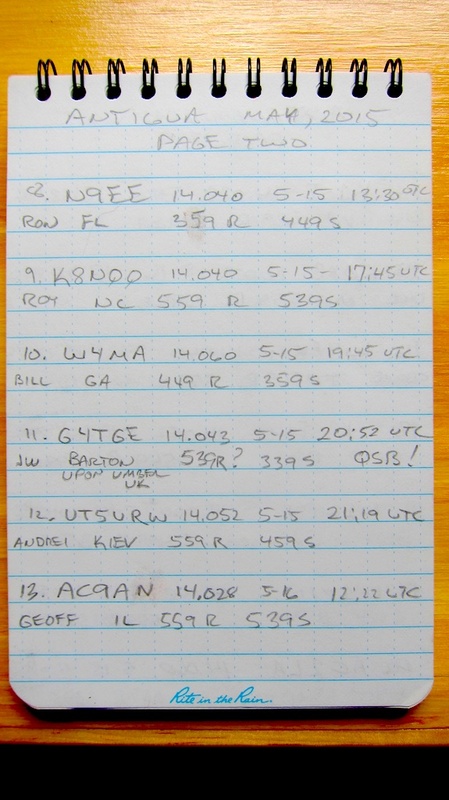 Yes, CW can travel quite far with minimal power, but it really helps if propagation is favorable. I was able to complete a QSO with UT5URW – Andrei in Kiev, Ukraine, so I was thrilled with that. He got the long-distance award! 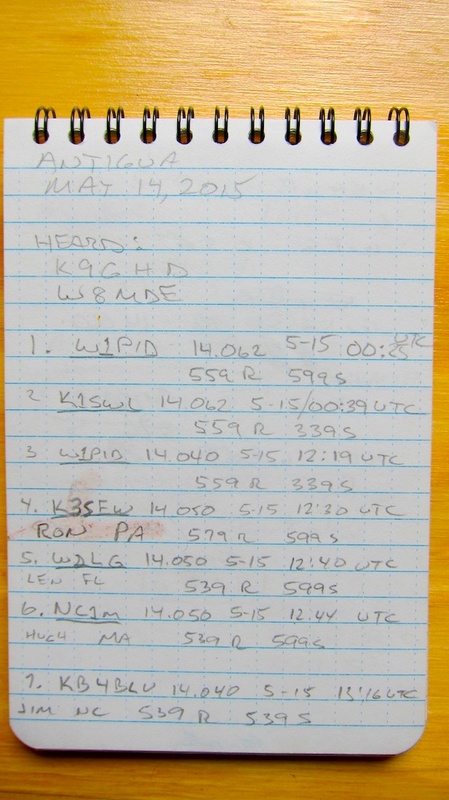 My outdoor QRP and CW mentor Jim Cluett – W1PID was able to work me several times. I was very excited that I was able to hear him and him me. He’s been eternally patient with my slow and steady, but sometimes backwards, progress in HF and CW. 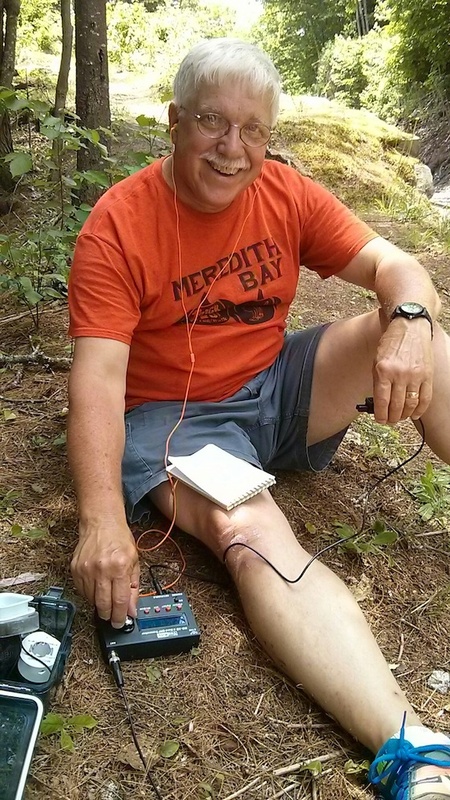 Jim is one of the giants in outdoor radio and has established quite a reputation in the QRP community. 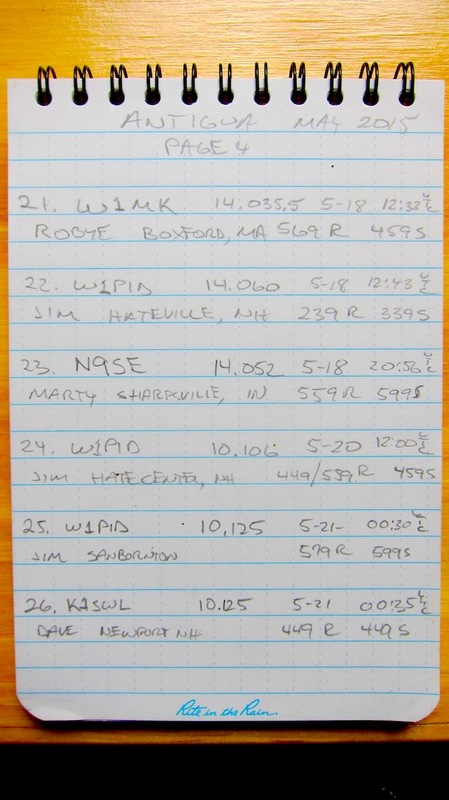 A new friend, Dave Benson – K1SWL who lives in New Hampshire and is an expert at low-power operation, was in my log two times. What a delight that was to work one of the icons of QRP radio! My biggest takeaway from the experience was it pays to have a longer coaxial cable from the antenna to where you think the best place is to operate. Just before the trip I purchased a 25-foot RG-174 cable. It was fantastic, but a 50-foot one would have had me operating on the screened porch. However, that long cable may have introduced too much loss with my QRP setup. I also came away knowing that I truly love doing CW and am more determined than ever to get better and better. There’s something magical to me about CW. It’s such a basic language when you think about it, but it confounds many. Yes it is. Powerful magic for the soul. I was also happy for all I was able to work so they would have Antigua as another foreign country in their log books. Antigua is a small country and it’s a third-world country. There can’t be but a handful of amateur operators on the island. Here are the four pages of contacts I made while in Antigua. It’s a week I’ll never forget, that’s for sure!